Mark was chosen for this award after donating a significant amount of time to the organization as an advisor and project architect on many of the recent substantial construction improvements made at the Long Beach community center. Specifically, Mark helped the AJCC with a second-level flooring repair project, a roof replacement, and a new solar project that is projected to save the organization $2.5 million dollars over the next 25 years! 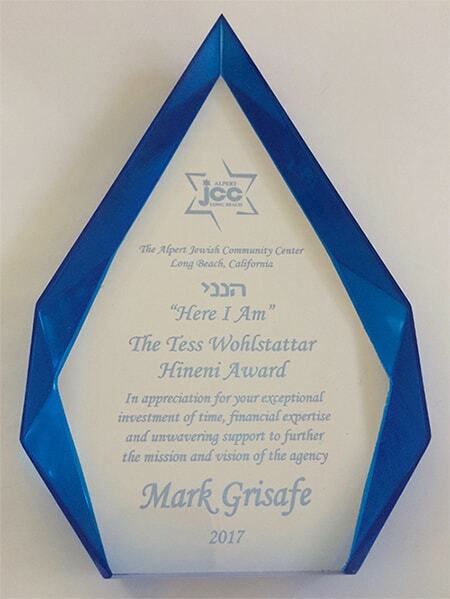 The AJCC is a great organization that is dedicated not only to providing programs and services to the Jewish community in Long Beach, but also to the community as a whole. They offer fitness and wellness programs, parenting classes, programs and activities for seniors, and youth sports leagues, classes, and camps. It’s a very active organization that benefits a large number of people in the community, and our Long Beach architecture firm is happy to support their efforts by lending our advice and expertise to them when they need it. Here at M. Grisafe Architects, we are deeply committed to doing our best to make the Long Beach community a better place to live and work. By supporting the infrastructural needs of a great agency like the AJCC, we feel we are helping to fulfill that commitment. If you’ve never taken advantage of any of the great programs organized by the AJCC, we highly encourage you to do so. You’re sure to meet some great people, just as we have by working with them, and your life will be greatly enriched. If you’re looking for a great local charity to support, we would also recommend the organization as being one that is both fiscally responsible and deserving of support based on the quality of work they are doing in the Long Beach community. If you’re interested in tapping into the expertise of a Long Beach architect, we’d love to talk with you. We’ve completed both residential and commercial projects in the city of Long Beach and the surrounding areas and would love to help you with your tenant improvement project, residential remodel, or new build.